The Class of 2017 made history as the largest ever at UTA. The University conferred 5,600 degrees in commencement ceremonies May 11-13 at College Park Center. 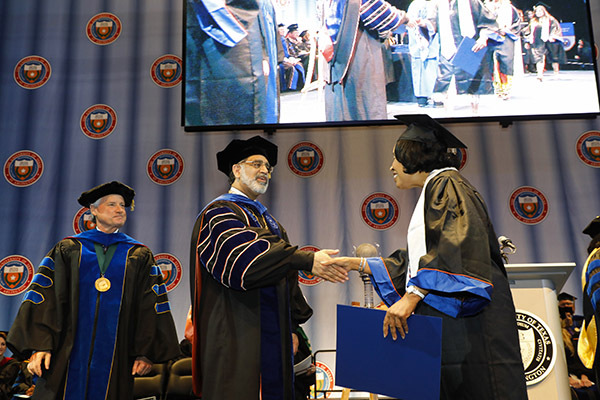 The newest graduates join the ranks of more than 214,000 UTA alumni around the globe. SEE MORE PHOTOS. For the second time in school history, the UTA men’s track and field team has claimed the conference “triple crown” after its victory at the Sun Belt Conference outdoor meet Sunday. The men won the 2016-17 SBC championships in cross country and indoor and outdoor track and field. The women's team placed third in this weekend's competition. LEARN MORE. Several campus construction and parking lot jobs will impact parking this summer. • West Street from Nedderman to 4th Street will be closed through Monday, Aug. 14, for water line repairs. Northbound traffic will be routed through parking Lot F10. The Library's ADA parking lot will be accessible through the Maverick Parking Garage. The ADA South parking lot will be closed, but additional temporary ADA parking will be available in the Maverick Parking Garage, F10, CPW, and KCN lots. The Maverick Garage will remain open throughout the street closure. • Asphalt repair work will be Monday, May 22, through Friday, June 2, in Lot 36 by the Social Work building. During this time, faculty and staff should use Lots F11 or F12, and students should use Lot S34. After two years of planning, the renowned International Folk Art Market | Santa Fe—rated the Best Art Festival in America by USA Today—is coming to the city of Arlington and UTA. 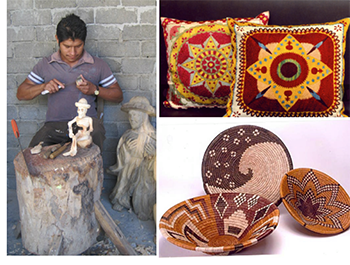 The inaugural Santa Fe International Folk Art Market at Arlington is Friday-Saturday, June 16-17, at The Green at College Park on the east side of the UTA campus. LEARN MORE. Pharos Pay to Print and Mobileprint will be unavailable to faculty, staff, and students 8 a.m.-noon Tuesday, May 23. These services will be upgraded to include the latest security patches and improvements. Contact the IT Help Desk at helpdesk@uta.edu with questions or concerns. TrailBlazer moves to a summer schedule after this week. Keep up with campus activities throughout the summer on every other Tuesday. The next TrailBlazer is May 30. Weekly editions return Aug. 22 for the fall semester. Send your news to trailblazer@uta.edu. Tuesday, May 23—Last day to drop for summer intersession. Monday, May 29—University closed for Memorial Day holiday. Wednesday, May 31—Final exams for summer intersession.